African American cultural background has been found to influence parenting style and its effect on child behavioral outcomes such as the development of disruptive behavior disorders (DBDs). As compared to Caucasian mothers, African American mothers place a greater emphasis on respect and compliance, and this authoritarian parenting style has been shown to produce positive outcomes for children. However, very few studies have analyzed cultural differences within a clinical sample of children with DBDs, or employed an observational measure such as the Dyadic Parent-Child Interaction Coding System (DPICS) to study such differences. The DPICS examines parenting-style constructs during three play situations: Child-Led play, Parent-Led play, and Clean-Up, which represent increasing demands on the child. This study compares African American and Caucasian mothers on observational measures of warmth and demandingness, and their preschool children on an observational measure of compliance. It was hypothesized that African American mothers would display higher demandingness across situations, and lower warmth in the Parent-Led play and Clean-Up situations. It was further hypothesized that African American children would display lower rates of non-compliance than Caucasian children. Results with 26 African American and 123 Caucasian mothers found no significant differences in maternal warmth. However, African American mothers were significantly more demanding than Caucasian mothers. Child noncompliance was not found to differ significantly between groups. These findings provide evidence that African American mothers of children with clinically significant behavior problems express higher demandingness but equal warmth as compared to Caucasian mothers. The results represent a valuable addition to the literature on African American parenting in clinical samples and on the acceptability of parent-training programs for minority families. Additionally, these findings support a re-examination of categorical parenting style definitions, considering ecological and cultural influences on the practice and interpretation of parenting. Thesis (M.S.) --University of Florida, 2011. 3 To my parents and friends who taught me to trust in God Without His immeasurable strengt h and grace, this would not have been possible. Philippians 4:13. 4 ACKNOWLEDGMENTS I would like to thank my mentor, Dr. Stephen Boggs, for his guidance, support, understanding, and patience. I gratefully acknowledge Dr. Sheila Eyberg, Dr. Regina Bussin g and the members of the Child Study Lab at the University of Florida for their dedication to the science and practice of c hild behavioral interventions. Also, I express my gratitude to my committee members for their thoughtful suggestions and encouragements. 10 lower rates of noncompliance than Caucasian children. Results with 26 African American and 123 Caucasian mot hers found no significant differences in maternal warmth. However, African American mothers were significantly more demanding than Caucasian mothers. Child noncompliance was not found to differ significantly between groups. These findings provide evidenc e that African American mothers of children with clinically significant behavior problems express higher demandingness but equal warmth as compared to Caucasian mothers. The results represent a valuable addition to the literature on African American parent ing in clinical samples and on the acceptability of parent training programs for minority families. Additionally, these findings support a reexamination of categorical parenting style definitions, considering ecological and cultural influences on the prac tice and interpretation of parenting. 14 Caucasian parents (Berlin et al., 1995; McLoyd & Smith, 2002). These ratings reflect not only the parenting behaviors exhibited by African American parents, but also hegemonic cultural beliefs about acceptable parenting (Shumow et al., 1998). Similarly, a study examining maternal control or int rusiveness, found that increasing control was associated with lower child engagement for Caucasian but not African American children (Ispa et al., 2004). Other investigators have found that higher levels of control in African American parents do not have negative consequences in the context of high warmth (Brody, Flor, & Gibson, 1999; Darling & Steinberg, 1993; McLoyd & Smith, 2002; Spieker, Larson, Lewis, Keller, & Gilchrist, 1990). Ispa et al. also found that though increasing parental intrusiveness (a measure of control) was associated with child negativity in both groups, the relationship diminished when examining African American parents who also exhibited high levels of warmth. In contrast, there is some support in the literature for similar trends i n the positive effects of authoritative parenting style for both African American and Caucasian parents. Though the average level of control reported by African American parents may be higher than Caucasian parents, the relationship between authoritarian parenting style and negative child outcomes persists (Shumow, Vandell, & Posner, 1998). In a study of three year old children and their parents participating in the National Institute of Child Health and Human Development Study of Early Child Care, responsi ve parenting was associated with increased compliance and decreased behavior problems in both African American and Caucasian children (WhitesideMansell, Bradley, Tresch Owen, Randolph, & Cauce, 2003). 19 Clean Up several toys by him or herself. In each situation, maternal warmth and demandingness (control) were measured by coding and categorizing all verbalizations expressed by the parent using the Dyadic Parent Child Interaction Coding System. Specific Aims The purpose of the current study was to examine cultural differences in parenting styles in a clinical sam ple of children with Disruptive Behavior Disorders and their mothers. Specifically, the parenting styles of African American and Caucasian mothers were compared during three standardized observations, ChildLed Play, Parent Led Play and CleanUp. Parenting style was measured using the Dyadic Parent Child Interaction Coding System (DPICS) and operationalized as the degree of warmth and demandingness exhibited by the mother during each play situation. Aim I Specific Aim I was to examine maternal warmth and demandingness in the Parent Led Play and CleanUp situations, which require the parent to exhibit greater control over the childs behavior. We hypothesized that African American mothers would display higher demandingness and lower warmth than Caucasian mothers in these situations. This hypothesis is based on support in the literature for the no nonsense method of parenting exhibited by African American mothers in order to train children to meet environmental challenges (Brody, Flor & Gibson, 1999; McGroder, 2000). In addition, results from the PCOG in a similar play situation indicated that African American mothers were rated lower on measures of sensitivity (Bernstein et al., 2005). 20 Aim II Specific Aim II was to investigate cultural differences in warmt h and demandingness in the ChildLed Play situation. We hypothesized that African American mothers would exhibit higher demandingness than Caucasian mothers, but equal warmth. In Child Led Play, the mother is not prompted to exhibit any control over the ch ild. However, cultural values impressing firm authority and discipline may lead African American mothers to exhibit greater demandingness in this situation. In agreement with the findings of Brody and Flor (1998), African American mothers may express higher levels of demandingness in the context of also demonstrating warmth with their children. Aim III Specific Aim III was to examine child noncompliance during the Parent Led Play and CleanUp situations. In past research using an observational measure, Af rican American mothers were rated as more effective disciplinarians, while their children showed high rates of compliance ( Bernstein et al., 2005). African American children may internalize cultural values that children should obey and respect adult author ity figures. Based on this evidence, we hypothesized that African American children would demonstrate lower rates of noncompliance to commands than Caucasian children. 23 25 minutes. Observations were recorded at each assessment of the two pretreatment assessments, totaling 30 minutes of parent child interaction data. Recorded sessions were later coded by two independent, trained, observers; one third of these sessions were randomly selected for reliability coding, Parent verbalizations were coded by type (e.g., praise, negative talk, command) and frequency using the DPICS system. The DPICS includes twelve verbalization categories (e.g., praise, reflection), and six response categories (e.g., comply, answer). Composite categories were created by combining several individual verbalization categories to represent a more general construct (e.g., warmth, demandingnes s) as validated in previous research (Algona & Eyberg, 1981; Brestan, Foote, & Eyberg, 2005). In order to examine parenting style (as defined by Baumrinds twofactor model), two composite categories were calculated and used in this study, Warmth, and Dema ndingness (maternal control). Other categories examined were: child noncompliance, and total verbalizations. Individual category definitions are presented in Table 22, and composite category definitions are presented in Table 23. The two observations were coded for the frequency of each verbalization category. The frequency counts in each category were then averaged and divided by the averaged Total Verbalizations score. This produced a percentage score which controlled for maternal verbosity. Mater nal Warmth was calculated in CLP, PLP, and CU. Only positive verbalizations such as praise and reflections were included in the warmth composite category. Commands (direct or indirect) were coded as noncompliable if their timing or phrasing prevented chi ld compliance. For instance, a parent may issue a new command too quickly for the child to complete the previous instruction. 25 the YC DISC have not yet been established, it is highly similar to the DISCIV P which has strong reliability. Oneweek test retest reliabilities of the DISC IV P with parents of 9 to 17year old children have been reported at .79 for ADHD, .54 for ODD, .54 for CD, (Shaffer, Fisher, & Lucas, 1998). At pretreatment as sessment children were required to meet diagnostic criteria for ADHD (Hyperactive or Combined type) on this measure. Eyberg Child Behavior Inventory (ECBI; Eyberg & Pincus, 1999) The ECBI is a 36item parent rating scale of disruptive behavior in children between the ages of 2 and 16 which contains an intensity and a problem scale. The ECBI Intensity Scale, which measures the frequency of childrens behaviors on a 7point scale from never (1) to always (7) was used in this study. The Intensity Scale yields an internal consistency coefficient of .95; inter rater (motherfather) reliability coefficient of .69; and test retest reliability coefficients of .80 across 12 weeks and .75 across 10 months. Adequate internal consistency and convergent validity with Af rican American preschoolers has been demonstrated (Gross, et al., 2007). Peabody Picture Vocabulary Test Third Edition (PPVTIII; Dunn & Dunn, 1997) The PPVTIII is a wellstandardized measure of receptive language in individuals age 2.6 years and older. Split half reliability coefficients for children have ranged from .86 to .97, with a median of .94, and test retest reliabilities have ranged from .91 to .94. The PPVTIII was the cognitive screening measure for inclusion of children in this study. Wonder lic Personnel Test (WPT; Dodrill, 1981) The WPT is a 50item screening scale of adults' intellectual abilities. In a sample of 120 normal adults, the WPT score was highly correlated (r = .93) with the WAIS Full Scale IQ score and was within 10 points. The WPT was the cognitive screening measure used for inclusion of mothers in this study. 26 Procedure Families attended two 3hour assessment sessions, scheduled one week apart. Assessments were conducted by graduate trainees. At Assessment 1, the parents completed the informed consent process, and if eligible completed measures addressing child behavior and family demographic information. This assessment also included the YC DISC and one DPICS observation. Families returned one week later for Assessment 2. At this time they participated in a semi structured clinical interview and another DPICS observation. Two DPICS observations were conducted for each family in order to ensure stability of the observational scores. Each observation session was conducted as follows: (1) 5 minute warm up for CLP, (2) 5 minute coding of CLP, (3) 5 minute warm up for PLP, (4) 5 minute coding of PLP (5) 5 minute coding of CU. All observations sessions were recorded for later coding. 29 Table 2 3 DPICS C omposite C ategories Category Equation Total Verbalizations pNTA + pDC + pIC + pLP + pUP + pIQ + pDQ + pRF + pBD + pTA. Warmth (pBD + pRF + pLP + pUP) Total Parent Verbalizations Demandingness pDC Total Commands Child Noncompliance cNC (pDC + pIC cNOC) Note: In category equations, p= parent verbalization/behavior and c=child verbalization/behavior. The Total Verbalizations, Warmth, and Noncompliance Composite Category definitions are taken from Eyberg, Nelson, Duke, & Boggs, 2005. The Demandingness category definition was taken from Algona & Eyberg, 1981. 33 demonstrate equivalent warm th based on this criteria, z(147)= 0.18, p=0.427. As the null hypothesis of nonequivalence was confirmed, a follow up independent samples t test was conducted to test for significant difference. Warmth in CLP was not significantly different between groups, t(147) = 0.73, p = 0.47. Hence, neither significant equivalence, nor significant difference was confirmed. These results may indicate that the variability in warmth was too great to detect statistical equivalence given the sample size used (particularly in the African American sample). Furthermore, though the groups were not equivalent in warmth, the 0.84% difference in warmth statements was not statistically significant. Aim III Children in both samples were examined for mean differences in noncompliance. Children of African American mothers exhibited average rates of noncompliance of 32% (SD = 23.5%) during PLP and 30% (SD = 29.9%), during CU. Children of Caucasian mothers demonstrated 37 % (SD = 23.2%) and 40% (SD = 25.2%) noncompliance rates on average. Group differences in noncompliance rates did not reach statistical difference for the PLP, t(147) = .94, p = 0.35, or CU situation t(147) = 1.86, p = 0.06. However, in the more demanding CU situation, children of Caucasian mothers complied 10.5% less frequently on average, a difference which approached significance t(147)=1.86, p = 0.06. Ttest statistics, means, standard deviations and probability values for the variables analyzed are presented in Table 31. 35 have ignored other significant di fferences in maternal leading. For t his reason, the investigator examined differences in indirect commands, and total commands (direct + indirect), between groups. Definitions of post hoc composite categories used for these analyses are listed in Table 32. Caucasian mothers were hypothesized to give more indirect commands than African American mothers. Because indirect commands are less effective at eliciting child compliance (Shriver & Allen, 1997; Wruble et al., 1991), Caucasian mothers were hypothesized to give more total commands as well Independent sample t tests revealed that significantly more of the commands given by Caucasian mothers were indirect commands during CLP (t = 3.43, p = .001), PLP (t = 4.17, p < .001) and CU (t = 4.57, p < .001). When analyzing total comma nds given, Caucasian mothers were found to give more commands during CLP, t(83.3) = 2.30, p = .02). However there were no significant differences found during the PLP (t = 1.20, p = 0.23) or CU (t = 1.43, p = .16) situations. T test statistics, means, standard deviations and probability values for the post hoc analyses are presented in Table 32. 36 Table 31 Primary analyses of differences in Demandingness, Warmth and Noncompliance Total Sample African American Caucasian (n = 149) (n = 26) (n = 123) Composite Variable /Situation Mean SD Mean SD Mean SD t(147) p Demandingness Child Led Play 58.39 21.8 71.26 20.27 55.62 21.22 3.43 0.001 Parent Led Play 58.20 18.1 70.95 17.17 55.49 17.19 4.17 < .001 Clean Up 62.92 18 76.71 16.00 60.01 17.10 4.57 < .001 Warmth Child Led Play 6.78 5.30 7.47 5. 91 6.63 5.18 0.73 0.465 Parent Led Play 4.67 3.58 4.28 2.96 4.76 3.70 0.58 a 0.561 Clean Up 5.96 5.62 5.04 4.75 6.15 5.79 0.90 a 0.369 Noncompliance Parent Led Play 35.69 23.22 31.81 23.50 36.51 23.18 0.94 0.350 Clean Up 38 .23 26.31 29.59 29.91 40.06 25.24 1.86 0.065 Note: For analyses marked a, inverse transformed variables were used to test for mean differences. 42 outcomes for young children. For instance, there is evidence to support that children of Afri can American parents who demonstrate firm, directive parenting are less likely to exhibit externalizing disorders or aggression (Baumrind, 1972; Deater Deckard, Dodge, Bates, and Pettit, 1996). However, while some research supports that a high level of mat ernal control and discipline has been associated with positive outcomes for African American children (Deckerd et al., 1986), other evidence suggests authoritarian parenting negatively effects children (Hall and Bracken, 1996; Querido, Warner & Eyberg, 2002). This contradiction is due in part to shifting definitions of authoritarian parenting style across studies. When examining the parentingstyle literature, it is important to consider the definition and measurement of the control variable analyzed in each study. Much of the literature has defined authoritarian control as harsh, punitive, intrusive behaviors (Tamis LeMonda, Briggs, McClowry, & Snow, 2008). Therefore authoritarian style has been measured as the degree that punitive discipline, critical and harsh responses, or even corporal punishment is reported. In contrast, this project defined control as the percentage of times that a mother gave direct commands to elicit compliance (demandingness). As such, both authoritarian and authoritative styles which are distinguished by high control, denote parents who employ firm, clear limits and direction. Parents with lower levels of control (demandingness) instead directed their children with more suggestions, requests, and reasoning. This theoretical premise contrasts with more negative definitions of authoritarian parenting and elucidates research promoting this style as adaptive for African American mothers within a sociocultural framework. 44 reconsideration of Baumrinds traditi onal definitions of parenting style. Though characterized by higher levels of control, the behaviors exhibited by African American mothers in this study do not fit within the conceptualization of authoritarian parenting as critical, harsh, or punitive. By instead regarding parenting styles as continuous categories, African American mothers who are higher on levels of control, but exhibit adequate warmth may still be considered authoritative. Furthermore, this subtype of authoritative parenting may be more environmentally adaptive and culturally acceptable for African American families. Finally, child noncompliance was analyzed in Parent Led play and CleanUp. Noncompliance is conceptualized as a negative response to parenting behaviors. Higher rates of noncompliance reflect less effective parental control or discipline. In addition, noncompliance may vary depending on the degree that parental control and child obedience is valued by ones culture. Cultural expectations regarding the parent child relationship are likely to influence both parenting practices and child behaviors. Research on cultural differences in noncompliance in nonclinical samples suggests that African American mothers are seen as as having more compliant children than Caucasian mothers ( Bernstein et al., 2005). In addition, because African American mothers employed more direct commands, it follows that their children would demonstrate lower rates of noncompliance (Shriver & Allen, 1997; Wruble et al., 1991). In this study, African America n and Caucasian children did not differ significantly in their rates of noncompliance to commands in PLP or CU. However, post hoc power analysis results suggested that the analysis of mean differences in CU may have been underpowered. 49 the c urrent study included mothers from both lower and middle class backgrounds. Research on African American parents which reflects inter group demographic variability will increase generalizability of findings and avoid the danger of reinforcing onedimensional stereotypes and prejudices. Finally, this study conceptualized control as an adaptive response to circumstances requiring childcompliance, thus moving beyond a negative view of African American parenting as harsh and punitive. Study findings challenged a purely categorical view of parenting styles. As the literature on culture and parenting advances, investigators should focus on providing clear definitions of parenting behaviors that go beyond parenting categories and broad constructs and consider ecological and cultural influences on the practice and interpretation of parenting sty le. 50 LIST OF REFERENCES Aragona, J. A., & Eyberg, S. M. (1981). Neglected children: Mothers' report of child behavior problems and observed verbal behavior. Child Developmen t, 52 (2), 596 602. doi:10.1111/j.14678624.1981.tb03085 Baumrind, D. (1967). Child care practices anteceding three patterns of preschool behavior. Genetic Psychology Monographs, 75, 43 88. Baumrind, D. (1971 ). Current patterns of parental authority. Deve lopmental Psychology, 4, 1 103. Baumrind, D. (1972) An exploratory study of socialization effects on black children: Some black white comparisons. Child Development, 43, 261 267. Baumrind, D. (1978). Parental disciplinary patterns and social competence in children. Youth and Society, 9 239 276. Baumrind, D. (1989). Rearing competent children. In W. Damon (Ed. ), Child Development Today and Tomorrow (pp. 349 378). San Francisco, CA: Jossey Bass. Baumrind, D. (1991 ). The influence of parenting style on adol escent competence and substance use. Journal of Early Adolescence, 11, 56 95. Baumrind, D., & Black, A. E. (1967). Socialization practices associated with dimensions of c ompetence in preschool boys and girls Child Development, 38, 291 327. Berlin, L. J., Brady Smith, C., & Brooks Gunn, J. (2002). Links between child bearing age and observed maternal behaviors with 14montholds in the early head start research and evaluation project. Infant Mental Health Journal, 23(1), 104 129. Berlin, L. J., Brooks Gunn, J., Spiker, D., & Zaslow, M. J. (1995). Examining observational measures of emotional support and cognitive stimulation in black and white mothers of preschoolers. Journal of Family Issues, 16(5), 664 686. Bernstein, V.J., Harris, E.J., Long, C.W., Iida, E., Hans, S.L. (2005). Issues in the multi cultural assessment of parent child interaction: An exploratory study from the starting early starting smart collaboration. Applied Developmental Psychology, 26, 241 275. Bessmer, J. L., Brestan, E. V., & Eyberg, S. M. (2005). The dyadic parent child interaction coding system II (DPICS II): Reliability and validity with mother child dyads. Manuscript in preparation. 51 Black, M. M., & Nitz, K. (1996). Grandmother co residence, parenting, and child development among lowincome urban teen mothers. Journal of Adolescent Health, 18, 218 226. Bluestone, C., & Tamis LeMonda, C. S. (1999). Correlates of parenting styles in predominately working and middleclass African American mothers Journal of Marriage and the Family, 61, 881 893. Boggs, S.R., Eyberg, S.M, Edwards, D.L., Rayfield, A., Jacobs, J., Bagner, D., & Hood, K.K. (2005). Outcomes of Parent Child Interaction Theraoy: A comparison of treatment completers and study dropouts one to three years later Child & Family Behavior Therapy, 26 1 22. doi: 10.1097 /0000458310060600000013. Bradley, R. H., Corwyn, R. F., Pipes McAdoo, H., & Garcia Coll, C. (2001). The home environments of children in the United States, part I: Variations by age, ethnicity, and poverty status. Child Development, 72(6), 1844 1867. Brestan, E. V., Foote, R. C., & Eyberg, S. M. (2005). The dyadic parent child interaction coding system II (DPICS II ): Reliability and validity wit h father child dyads. Manuscript submitted for publication. Brinkmeyer, M. Y. (2005). Conduct Disorder in Young Children: A Comparison of Clinical Presentation and Treatment Outcome in Preschoolers with Conduct Disorder versus Oppositional Defiant Disorder. University of Florida, Gainesville. Brodsky, A.E., & DeVet, K.A. (200 0). "You have to be real strong": Parenting goals and strategies of resilient, urban, African American, single mothers. Journal of Prevention and Intervention in the Community, 20, 159 178. Brody, G.H., & Flor, D.L. (1997). Maternal psychological functioni ng, family processes and child adjustment in rural, single parent African American families. Developmental Psychology 33, 1000 1011. Brody, G.H., & Flor, D.L. (1998). Maternal resources, parenting practices and child competence in rural, singleparent Af rican American families. Child Development, 69, 803 816. Brody, G.H., & Flor, D.L., & Gibson, N.M. (1999). Linking maternal efficacy beliefs, developmental goals, parenting practices, and child competence in rural, singleparent African American families. C h i ld Development, 70 1197 1208. Caldwell, B. M., & Bradley, R. H. (1984). Home observation for measurement of the environment. Little Rock, AR: Center for Child Development and Education, University of Arkansas. 52 Campbell, S. B. (1995). Behavior problem s in preschool children: A review of recent research. Journal of Child Psychology and Psychiatry, 36, 113 149. doi: 10.1111/j.14697610.1995.tb01657.x. Cauce, A. M., DomenechRodrguez, M., Paradise, M., Cochran, B. N., Shea, J. M., Srebnik, D., et al. (2002). Cultural and contextual influences in mental health helpseeking: A focus on ethnic minority youth. Journal of Consulting and Clinical Psychology, 70, 44 55. Cohen, J. (1988). Statistic al Power Analysis for the Behavioral Sciences (2nd ed,). Hillsdale NJ: Erlbaum. Cross Calvert, S., & McMahon, R. J. (1987). The treatment acceptability of a behavioral parent training program and its components. Behavior Therapy, 2, 165 179. Cunningham, C. E., & Barkley, R. A. (1978). The effects of Ritalin on the moth er child interactions of hyperkinetic twin boys Developmental Medicine and Child Neurology, 1, 634 642. Cunningham, C. E., & Barkley, R. A. (1979). The interactions of hyperactive and normal children with their mothers in free play and structured task. C hild Development, 50, 217 224. Darling, N., & Steinberg, L. (1993). Parenting style as context: An integrative model. Psychological Bulletin, 113(3), 487 496. Davis, O,L., Nakayam, T.K., & Martin, J.N. (2000). Current and future directions in ethnicity and methodology. International Journal of Intercultural Relations, 24, 525 539. Deater Deckard, K., Dodge, K.A., Bates, J.E., & Petit, G.S. (1996). Physical discipline among African American and European American mothers: Links to children's externalizing behaviors Developmental Psychology, 32 (6), 1065 1072. Dodrill, C.B. (1981). An economical method for the evaluation of general intelligence in adults. Journal of Consulting and Cli nical Psychology, 56, 145 157. doi: 10.1037/00220005X.49.5.668 Dornbush, S ., Ritter, P., Liederman, P., Roberts, D., & Fraleigh, M. (1987). The relationship of parenting style to adolescent school performance. Child Development, 58, 1244 1257. Dun, L.M., & Dunn, L.M. (1997). Examiners manual for the PPVT3: Peabody Picture Voc abulary Test Third Edition. Circle Pines: MN: American Guidance Service. 54 Jarret, R.L. (1999). Successful parenting in highrisk neighborhoods. The Future of Children, 9, 45 49. Jarrett, R.L. (1997). Resilience among low i ncome AfricanAmerica n youth: A n ethnographic perspective. Ethos, 25, 1 12. Jones, D.J., Forehand, R., Brody, G., Armistead, L. (2003). Parental monitoring in African American single mother headed families: An ecological approach to the identification of predictors. Behavior M odification, 27(4), 435 457. Kagitibasi, C. (1996). Family and human development across cultures. Mahwah, NJ: Erlbaum. Kazdin, A. E. (1990). Premature termination from treatment among children referred for antisocial behavior. Journal of Child Psychology and Psychiatry, and Allied Disciplines, 31, 415 425. doi:10.1111/j.14697610.1990.tb01578.x. Kazdin, A. E. (1996). Dropping out of child psychotherapy: Issues for research and implications for practice. Clinical Child Psychology and Psychiatry, 1, 133 156. doi:10.1177/1359104596011012. Kazdin, A. E., Holland, L., & Crowley, M. (1997). Family experience of barriers to treatment and premature termination from child therapy. Journal of Consulting and Clinical Psychology, 65, 453 463. doi:10.1037/0022006X.65. 3.453. Kelley, M. L., Power, T. G., & Wimbush, D. D. (1992). Determinants of disciplinary practices in low income black mothers. Child Development, 63, 573 582. Kelley, M. L., Reitman, D., & Noell, G. H. (2003 ). Practitioner's Guide to Empirically Based Measures of School Behavior. New York: Kluwer Academic/Plenum. Kelley, M. L., Sanchez Hucles, J., & Walker, R. (1993). Correlates of disciplinary practices in workingto middleclass African American mothers. MerrillPalmer Quarterly, 39, 252 2 5 6 Kelley, M L., Sanchez Hucles, J., & Walker, R. R. (1993). Correlates of disciplinary practices in workingto middle class African A merican mothers Merrill Palmer Quarterly, 39 252 264. Krain, A.L., Kendall, P.C., & Power, T.J. (2005). The role of treatment acceptability in the initiation of treatment for ADHD Journal of Attention Disorders, 9, 425 434. doi:10.1177/1087054705279996. Krause, N.M., & Jay, G.M. (1994). What do global self rated health items measure? Medical Care, 32, 930 942. 55 Lambert, M.C., Weisz, J.R., & Knight, F. (1989). Overand under controlled clinic referral problems of Jamaican and American children and adolescents: The culture general and culture specific. Journal of Consulting and Clinical Psychology, 57, 467 472. L andis, J.R., & Koch, G.G. (1977). The measurement of observer agreement for ca tegorical data. Biometrics 33 159 174.doi:10.2307/2529310 Lansford, J.E., Deater0Deckard, K., Dodge, K.A., Bates, J.E., & Petit, G.S. (2004). Ethnic difference in the link between physical disciplin e and later adolescent externalizing behaviors. Journal of Child Psychology and Psychiatry, 45(4), 801 812. Leung, K., Lau, S., & Lam, W. L. (1998). Parenting styles and achievement: A cross cultural study. MerrillPalmer Quarterly, 44, 157 172. Lin, C. C. & Fu, V. R. (1990). A comparison of childrearing practices among Chines, immigrant Chinese and CaucasianAmerican parents. Child Development, 61, 429 433. Lucas, C. P., Fisher, P., & Luby, J. L. (2008). Young Child DISC IV: Diagnostic Interview Schedule for Children. New York: Columbia University: Division of Children Psychiatry, Joy & William Ruane Center to Identify and Treat Mood Disorders. Maccoby, E., & Martin, M. (1983). Socialization in the context of the family: Parent child interaction. In E. M. Hetherington (Ed. ), Handbook of child psychology (Vol. 4, pp. 1 101). New York: Wiley. Mandara, J., & Murray, C. B. (2000). Effects of parental marital status, income and family functioning on African American adolescent self esteem Journal of Family P sychology, 14, 475 490. Mash, E. J., & Johnston, C. (1983). Parental perceptions of child behavior problems, parenting self esteem, and mothers' reported stress in younger and older hyperactive and normal children. Journal of Consulting and Clinical Psychology, 51, 86 99. Mason, C., Cauce, A., Gonzales, N., & Hiraga, Y. (1996). Neither too sweet nor too sour: Problem peers, maternal control, and problem behavior in African American adolescents. Child Development, 67, 2115 2130. McLoyd, V. C. (1990). The impact of economic hardship on black families and children: Psychological distress, parenting, and socioemotional development. Child Development, 67, 311 346. 56 McLoyd, V.C., Cauce, A.M., Takeuchi, L.W., Leon (2000). Marital Processes and Parental Socialization in Families of Color: A Decade of Research. Journal of Marriage and Family, 62, 1070 1093. McLoyd, V.C., & Smith, J. (2002). Physical discipline and behavior problems in African American, European American, and Hispanic children: Emotional support as a moderator. Journal of Marriage and Family, 64(1), 40 53. McGroder, S. M. (2000). Parenting among low income, African American single mothers with preschool age children: Patterns, predictors, and developmental correlates. Child Development, 71, 752 771. Mi ltenberger, R. G. (1990). Assessment of treatment acceptability: A review of the literature. Topics in Early Childhood Special Education, 10( 3), 24 38. Murray, V.M., Bynum, M.S., Brody, G.H., Willert, A., & Stephens, D. (2001). African American single mothers and children in context: A review of studies on risk and resilience. Clinical Child and Family Psychology Review, 1 133 155. Querido, J.G., Warner, T.D., & Eyberg, S.M. (2002). Parenting styles and Child Beahvior in African American Families of Presc hool Children. Journal of Clinical Child Psychology, 31, 272 277. Rapee, R.M. (1997). Potential role of childrearing practices in the development of anxiety and depression. Clinical Psychology Review, 17, 47 67. Reid, M.J., Webster Stratton, C., & Beaucha ine, T.P. (2001). Parent training in head start: A comparison of program response among African American, Asian American, Caucasian, and Hispanic mothers Prevention Science, 2, 209 227. Reimers, T. M.,Wacker, D. P., & Koeppl, G. (1987). Acceptability of behavioral interventions: A review of the literature. School Psychology Review, 16, 215 227. Rogers, J.L., Howard, K.I., & Vessey J.T. (1993). Using significance tests to evaluate equivalency between two experimental groups. Psychological Bulletin, 3, 5 53 565. doi: 10.1037/00332909.113.3.553. Schaffer, D., Fisher, P., Lucas, C.P., Dulcan, M.K., & Schwab Stone, M.E. (2000). NIMH diagnostic interview schedule for children version IV (NIMH DISC IV): description, differences from previous versions and reliability of some common diagnoses. Journal of the American Academy of Child & Adolescent Psychiatry, 39, 28 38. doi: 10.1097/00004583020000100000014. Schuhmann, E. M., Foote, R. C., Eyberg, S. M., Boggs, S. R., & Algina, J. (1998). Efficacy of parent child interaction therapy: Interim report of a randomized trial with short term maintenance. Journal of Clinical Child Psychology, 27(1), 34 45. 57 Shumow, L., Vandell, D. L., & Posner, J. K. (1998). Harsh, firm and permissive parenting in low income families Journal of Family Issues, 19, 483 507. Shriver, M.D., & Allen, K.D. (1997). Defining child noncompliance: an examination of temporal parameters. Journal of Applied Behavior Analysis, 30, 173 176. doi: 10.1901/jaba.1997.30 173. Simons. R.L., Simons, L.G., Burt, C.H., Drummund, H., Stewart, E., Brody, G.H., Gibbons, F.X., & Cutrona, C. (2006). Supportive parenting moderates the effect of discrimination upon anger, hostile view of relationships, and violence among African American boys. Journal of Health and Soci al Behavior, 47( 4), 373 389. Spieker, S.J., Larson, N.C., Lewis, S.M., Keller, T.E., & Gilchrist, L. (1999). Developmental Trajectories of Disruptive Behavior Problems in Preschool Children of Adolescent Mothers. Child Development, 70, 443 458. Steinberg, L., Elmen, J.D., & Mounts, N.S. (1989). Authoritative parenting, psychosocial maturity, and academic success among adolescents. Child Development, 60, 1424 1436. Steinberg, L. (1990). Interdependency in the family: Autonomy, conflict and harmony. In S. F eldman & G. Elliot (EDs . ), At the threshold: The developing adolescent Cambridge, MA: Harvard University Press. Steinberg, L., Mounts, N. S., Lamborn, S. D., & Dornbusch, S. M. (1991). Authoritative parenting and adolescent adjustment across varied ecological niches. Journal of Research on Adolescence, 1, 19 36. Stevens, S.S. Mathematics, measurement, and psychop hysics. In S.S. Stevens (Ed. ), Handbook of experimental psychology New York: Wiley, 1951. Tamis Lemonda, C.S., Briggs, R.D., McClowry, S.G., & Snow, D.L. (2008).Challenges to the s tudy of African Ameri can parenting: Conceptualization, sampling, research approaches, measurement, and design. Parenting: Science and Practice, 8, 319 358. doi: 10:1080/15295190902612599 Taylor, R. D. (2000). An examination of the association of African American mothers perceptions of their neighborhoods with their parenting and adolescent adjustment. 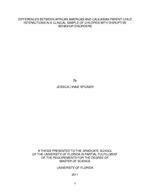 Journal of Black Psychology, 26, 267 287 Thomas, A. J. (2000). Impact of racial identity on African American childreari ng beliefs. Journal of Black Psychology, 26, 317 329. Thornbery, T., Brestan Knight, E. (2011). Analyzing the utility of dyadic parent child interaction coding system (DPICS) warm up segments. Journal of Psychological and Behavior Analysis, 33, 187 195. 58 U.S. Department of Health and Human Services (USDHHS). ( 2001). Mental health: Culture, race, and ethnicity A supplement to mental health: A report of the surgeon general. Rockville, MD: U.S. Department of Health and Human Services, Substance Abuse and Ment al Health Services Administration, Center for Mental Health Services. Weisz, J. R., Donenberg, G. R., Han, S. S., & Weiss, B. (1995). Bridging the gap between laboratory and clinic in child and adolescent psychotherapy. Journal of Consulting & Clinical Psy chology, 63, 688 701. Weisz, J. R., & Hawley, K. M. (1998). Finding, evaluating, refining, and applying empirically supported treatments for children and adolescents Journal of Clinical Child Psychology, 27, 206 216. Whaley, A. L. (2000). Sociocultural di fferences of the use of physical discipline during childhood for African Americans. Cultural Diversity and Ethnic Minority Psychology, 6(1), 5 12. WhitesideMansell, L., Bradley, R. H., Little, T. D., Corwyn, R. F., & Spiker, D. (2004). An examination of c ross racial comparability of mother child interaction among African American and Anglo American families Journal of Marriage and Family, 63(3), 767 778. WhitesideMansell, L., Bradley, R. H., Tresch Owen, M., Randolph, S. M., & Cauce, A. M. (2003). Parent ing and children. Parenting: Science and Practice, 3(3), 197 234. Wilson, L. J., & Jennings, J. N. (1996). Parents acceptability of alternative treatments for attentiondeficit hyperactivity disorder. Journal of Attention Disorders, 1, 114 121. Wilson, M. N., Kohn, L. P., Curry El, J., & Hinton, I. D. (1995). The influence of family structure characteristics on childrearing behaviors of African American mothers. Journal of Black Psychology, 21( 4), 450 462. Witt, J. C., & Ell iott, S. N. (1985). Acceptability of classroom intervention strategies. In T. R. Kratochwill (Ed. ), Advances in school psychology Hillsdale, NJ: Lawrence Erlbaum. Wruble, M. K., Sheeber, L. B., Sorensen, E. K., Boggs, S.R., & Eyberg, S. (1991). Empirical derivation of child compliance time. Child and Family Behavior Therapy, 13, 57 68. Yeh, M., Hough, R. L., McCabe, K., Lau, A., & Garland, A. (2004). Parental beliefs about the causes of child problems: Exploring racial/ethnic patterns. Journal of the Ameri can Academy of Child and Adolescent Psychiatry, 43, 605 612. 59 Yeh, M., McCabe, K., Hough, R. L., Lau, A., Fakhry, F., & Garland, A. (2005). Why bother with beliefs? Examining relationships between race/ethnicity, parental beliefs about causes of child probl ems, and mental health service use. Journal of Consulting and Clinical Psychology, 73, 800 807. Zaslow, M. J., Weinfield, N. S., Gallagher, M., Hair, E. C., Ogawa, J. R., Egeland, B., Tabors, P. O., & De Temple, J. M. (2006). Longitudinal prediction of chi ld outcomes from differing measures of parenting in a low income sample. Developmental Psychology, 42(1), 27 37. 60 BIOGRAPHICAL SKETCH Jessica Lynne Spigner graduated from Stanford University with a Bachelor of Arts degree in psychology in June, 2008. She is currently pursuing a doctoral degree in clinical and health psychology with a concentration in child clinical psychology at the University of Florida. Jessicas research interests include the development of childhood behavior and mood disorders, the acc eptability and effectiveness of evidencebased interventions for minority and at risk families, and sociocultural influences on child development.